They spent four one-hour class sessions on simplified reproductions of work by influential artists, such as Claude Monet, Andy Warhol and Edvard Munch. Stanton-Nutt and her students offered refreshments during a “Plow Walk” on Tuesday, introducing many of the street department employees to the images that will be affixed to their plows this season. 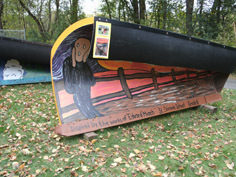 It’s the second year the city provided paints for the kids to brush murals onto the blades. “We’ve got to paint them anyways,” said T.J. Heinricy, the streets and parks supervisor. Looking at the 12 detached blades on the school’s lawn Tuesday, Heinricy was impressed. “This beyond beats my expectations,” Heinricy said. Assistant Public Works Director and Assistant City Engineer Brian Erickson thanked Stanton-Nutt for her continued involvement with the concept the city borrowed from Green Bay, Wis.
“We could paint them yellow, or we could paint them like this,” Erickson said. Reprinted from the October 22, 2013, issue of the Northfield News.